Reltron is a prototype user interface for exploring relational databases. This was a collaboration with Jamie Brandon. In 2018 August Jamie and I started talking about this problem space as part of my interest in presenting relational data. We decided to explore the problem in the context of a prototype, which we collaborated on through 2018 November. too IDE-like, oriented towards power users (who are happy to write SQL by hand) and difficult to use “casually”. Example: MySQL workbench. 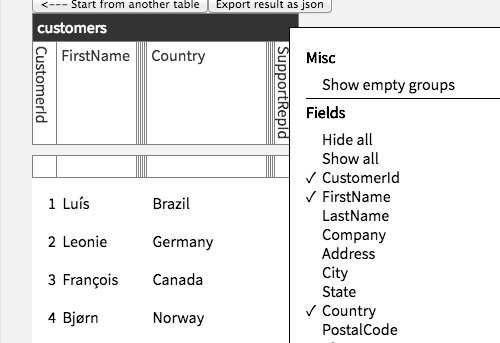 over-simplified “choose a single table and see it like a spreadsheet” GUIs that make it difficult/impossible to look at data relationally (i.e., join) without resorting to writing SQL queries. Example: DB Browser for SQLite. We wanted to explore an interface that would let someone just “open up a database” and immediately explore with searches and joins without requiring that they fully internalize the schema, tables, key relationships, etc. Crawford’s Data modeling for humans talk at CSVConf 2017. Both of us think Reltron could be useful for casual database viewing tasks. However, as of Jan 2019 we’re tabling the project until we have a concrete, motivating use case to inform further development. Join discoverability: When one encounters a new database, it’s hard to know what tables exist and what columns can be reasonably joined to what. Reltron infers join possibilities using declared foreign-key relationships. but this method only works in one direction (on tables that reference others, not on tables that are referenced by others). The sidebar also let us implement search and jump-to-column hotkeys that addressed frustrations we had with early prototypes, which required excessive mousing, scrolling, and context menuing. 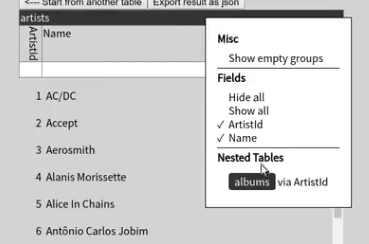 Arbitrary search: It’d be nice if the sidebar searched all tables/columns, rather than just the visible ones. Then one could open up a new database and just start typing for what you’re looking for (“country”, “customer”, etc.) without having to know the specific table name such data might be stored within. We tried the label “show empty groups”, but I found this confusing since it appeared in the context of the child table but referred to the rows of the parent table. “Inner” and “Left” are clearer to me, but I’ve already internalized SQL semantics; unclear whether clearer language exists. Arbitrary joins: It’s not clear where in the UI we’d add support for arbitrary joins; could this be done in a direct manipulation fashion, or would it have to be some kind of “wizard” popup flow? From a UI perspective, it’s not immediately clear what the bubbles are or where they come from — they don’t obviously map to the “rectangular” perspective of tables with rows and columns that we assumed most users would have. So we nixed the bubble idea and decided to keep things uniform by always displaying values in cells that are clearly associated with rows/columns/tables. We tried to do the backend in ClojureScript using database libraries from the Node ecosystem, but ran into race conditions and their inability to support necessary features such as in-flight query cancellation (which is required to efficiently support updating the data on every keystroke of, e.g., a column filter). Since we weren’t thrilled by the quality of the libraries we found in the Node ecosystem, we rewrote the backend in Rust and integrated with the frontend using Neon and the architecture described here. The idea was to remind users that some columns still existed, and were just visually “narrowed” to save space. However, as we implemented additional direct manipulation features such as column resizing and reordering, it wasn’t clear how hidden columns should interact. Should it be possible to reorder a wide column by dropping it in-between a group of hidden/narrow columns? If one resizes a column to 2px, is that the same as clicking “hide column” in the menu? Can a hidden/narrow column be resized to be visible, or does it have to be “unhidden” via the context menu first? Once we implemented the sidebar (which lists all columns, hidden or not) we decided to remove the 2px reminder and hide columns outright. 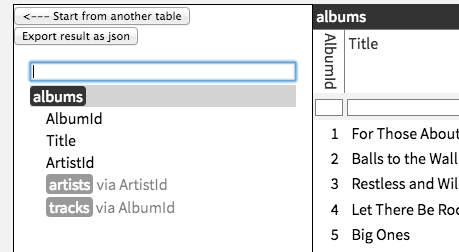 Table rendering: The main data view was initially rendered using HTML <table>s, the idea being that the browser could handle all layout calculations related to hierarchical data. However, this required us to write some awkward code to calculate rowspan / colspan attributes. So we decided to handle the fundamental width calculations ourselves and render using CSS flexbox with nested div representation. Horizontal space: We quickly realized that horizontal space is at a premium when working with rectangular data, so Reltron saves space by sizing columns to “roughly fit” their data. When first opening/joining a table, it samples values from the backend to determine a “typical width”. This helps most often for auto-incrementing integer ID columns, whose width grows as log10 the number of records. 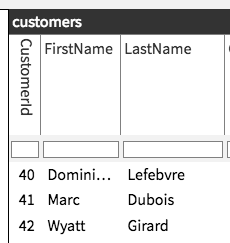 Here notice that the “CustomerId” label is rotated vertically to save horizontal space, and a long FirstName value in the first row is truncated.